Unfortunately, however, I did stumble upon that episode of Riverdale. You know the one – the terrible rendition of the broadway musical? Sorry guys, but it was a flop. So, as you could have guessed, I didn’t exactly have the best introduction to this novel. However, I was pleasantly surprised. Carrie is much less cliched than that horrible Riverdale episode made it out to be, and actually a pretty good novel. Firstly, this novel is paced really well. As I mentioned in my review of Illuminae, I love it when authors get creative, and Stephen King certainly didn’t hold back. Actually, much like Illuminae, Carrie is told in multiple formats and kind of functions as report on an event. However, it also flits across the timeline, which was really effective. This book absolutely flew by and I was always eager to read on and to explore all of the different perspectives King presented us with. Furthermore, I found the characters to be deliciously complex in their motivations. They were certainly three-dimensional and actually life-like, which is a stark contrast to the weak characters we are usually presented with in horror novels. I found them really engaging and interesting to follow, which really added to the conclusion – I didn’t know whether to be happy or sad, which honestly is one of my favourite types of endings. On that note, however, we need to talk about the horror. This book wasn’t scary. At all. A little disturbing, perhaps, in parts – but not because of the actual horror element rather than the more life-like elements. This actually reminded me a lot of the style of the TV series, American Horror Story, wherein the truly horrifying moments are usually a product of human actions as opposed to supernatural elements – like the school shooting in season 1, or the twisted doctors and nuns in season 2. Carrie is much like this in its references to bullying, childhood neglect and fanatic religion. But if you’re looking for a scary, thrilling novel, this isn’t it. Because this isn’t your typical horror story. It has much more life to it – more of an underlying moral story and more of a conscience. King himself even claimed this book was an allegory for feminism, which is a whole other discussion in itself, but it makes sense. This isn’t just a mindless horror story. It has a sort of scientific explanation behind it, as if this really is something that could happen. It has contrasting and conflicting characters and is told in a really engaging manner – one that makes you think. If you’re a fan of Stephen King’s books, please let me know in the comments which of his books I should read next! 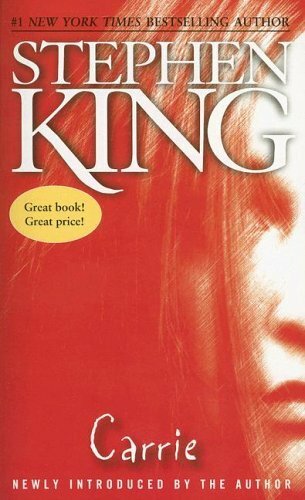 It’s years since I’ve read this, or any Stephen King but he was one of my favourite authors in my teens. Loved the original adaptation of this too! Great review! 🙂 I just finished my re-read of this last weekend! I definitely agree that this book wasn’t scary. I just watched the TV adaptation they did in 2002 (which I only just found out exists) & it feels like it’s a literal adaptation where it felt like they took it almost word for word from the book. It was very dragged out, and the actors didn’t feel like they had chemistry with one another, but worth watching if you’re a King fan! I’ve watch all three of them, and I think the 1976 version is the best. Then again, I tend to like old movies. I read lots of his books when I was younger, and don’t know so much about his more recent work. I’d recommend The Bachman Books https://en.wikipedia.org/wiki/The_Bachman_Books and Different Seasons https://en.wikipedia.org/wiki/Different_Seasons. They’re collections of short stories/novellas, and are more unsettling thrillers than horror stories, which works for me. His short stories work better for me than his mammoth books like It and The Stand, though that says more about my impatience than his writing, I think. Here’s a very interesting review of It https://www.theverge.com/2017/9/1/16028300/stephen-king-it-movie-adaptation-book-recap-horror-summer to whet your appetite.